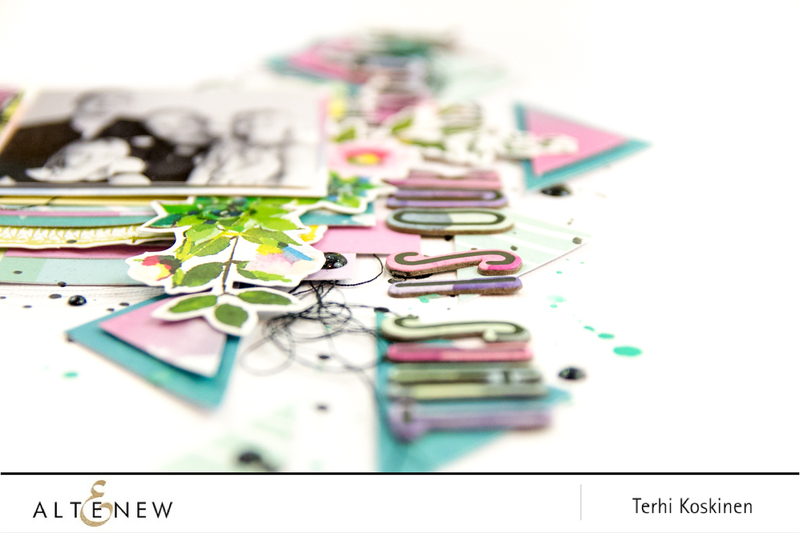 Time for another inspiring and colorful Blog Hop with Altenew. 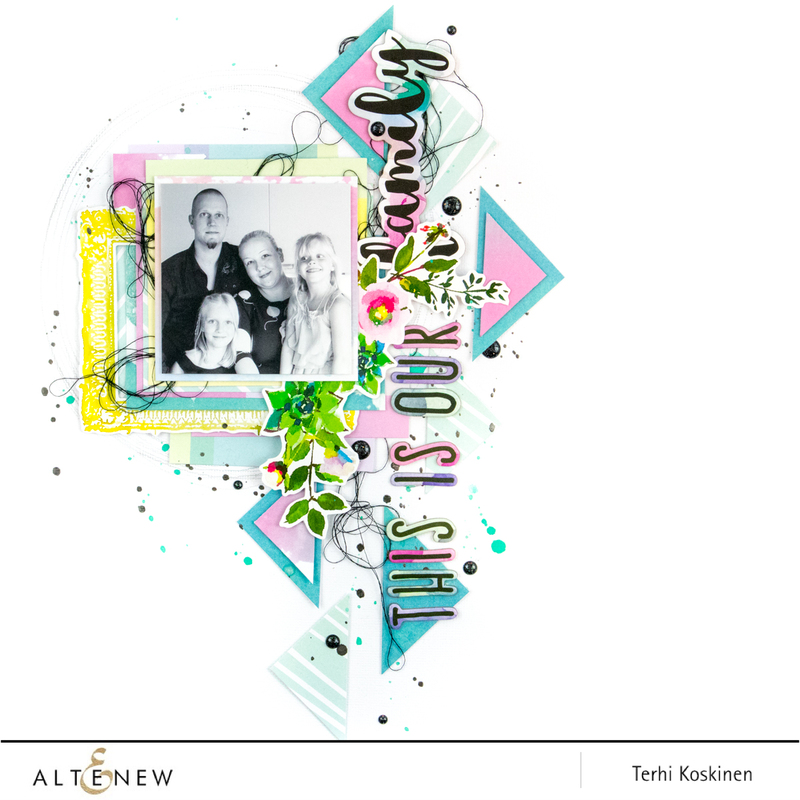 I'm always excited to share new things here, but this time the new scrapbook collection 'Our Family' from Altenew makes this so much more special. I did love the first collection 'Reflection' from Altenew, but I have to admit the designers made huge progress with this second one. I mean, just look at the patterns and colors! And thickers! And and and. Lol, I'm so excited! As the collection name is 'Our Family', so I simply started this first layout with that specific theme. It was easy, as my family is the most important thing in my whole life. Couldn't live without my gorgeous handsome and thoughtful husband who happens to be my best friend. And my sweet, clever and fun daughters who are growing into smart and beautiful women some day. And of course my puppies, three pretty and very humouristic furry heads who are making laugh each and every day by acting just as they do. It's a shame we don't have fresh family photos with the doggies, have to take a photoshoot session some day soon. But now let's stop talking and go into the best part: giveaway. Win $30 gift certificate to spend in Altenew store! The giveaway is super simple: just leave a comment here on my blog until Sunday, October 30th at 11:59pm EDT and I'll draw a random winner on 2nd November - the winner is announced here in my blog then. Remember to come back and see if you won. Now leave a comment here in my blog in order to join the giveaway, the continue to Svitlana Shayevich's blog. Thank you so much for stopping by! Thank you! Beautiful details and layers in this layout! Such a beautiful project! I love the pops of color against the black and white photo! Terhi you did it again! This is a fabulous LO, love the colors and playfulness of it! Love this collection! Thanks for sharing! I love the layering... Thanks for sharing. Beautiful layout! I love the shapes and keeping the title on the side - it really highlights the family picture! Lovely layout! So colorful! Thanks for sharing! Beautiful layout with a unique design. This is a very pretty layout!! Gorgeous layout! Love the vibrant colors and the all the layers. So interesting and beautiful. 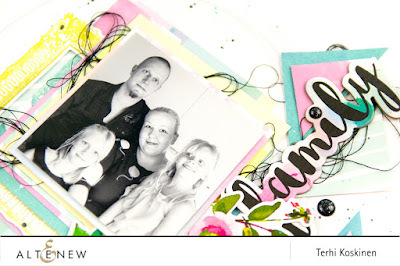 What a pretty layout and sweet looking family! wow, just wow! This layout is so fun, bright and looks amazing with all those layers! Great job! Wow! This is a beautiful layout! Love the design and the colors. Lots of great elements on this layout. Beautiful layout - bright, happy and wonderfully placed. Love the versatility of the new release! Thanks for sharing your talent with us! Beautiful layout - I love it! Beautiful scrapbooking kit! Thanks for sharing the inspiration. Beautiful layout. This is a great release. Loving the line up of triangles and all the layers beneath your photo. Beautiful layout! I love how you added the geometric to the edge. Thanks for the inspiration. This new kit is awesome! Gorgeous layout, love the layers!!! Beautiful family and lovely layout to show them off! Oh wow, what a beautiful layout with that beautiful collection! Love the bold yet soft colors in this kit. Your pages are awesome! Gorgeous layout. Love the colours and all the little details floating around. Love all the layering on this gorgeous layout! Love your layout and the new Altenew family life collection. So colorful! Gorgeous layout as is the new Altenew family kit. Beautiful colours and elements to use and those fantastic embossing powders. 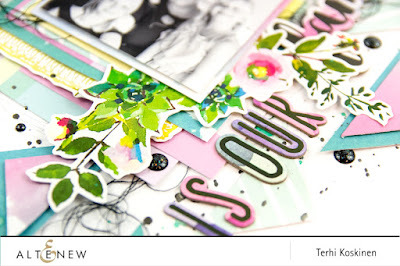 Love the placement of the Scrapbook kit elements on your stunning layout! I can’t help but drool just a little bit! TFS! Lovely scrapbook page. You have a beautiful family. Beautiful page. I love the colors of the new collection. Love this page the layering is great! Lovely layout. I'm so looking forward to seeing you at CAD 2018 in New Zealand!!! I love the layers and detail of this page. Simple and pulls the eye towards the photo. So pretty. I love how everything coordinates, but I have to admit...I would probably hoard these papers! thank you. You've done some wonderful layering on this page. Thanks for sharing. 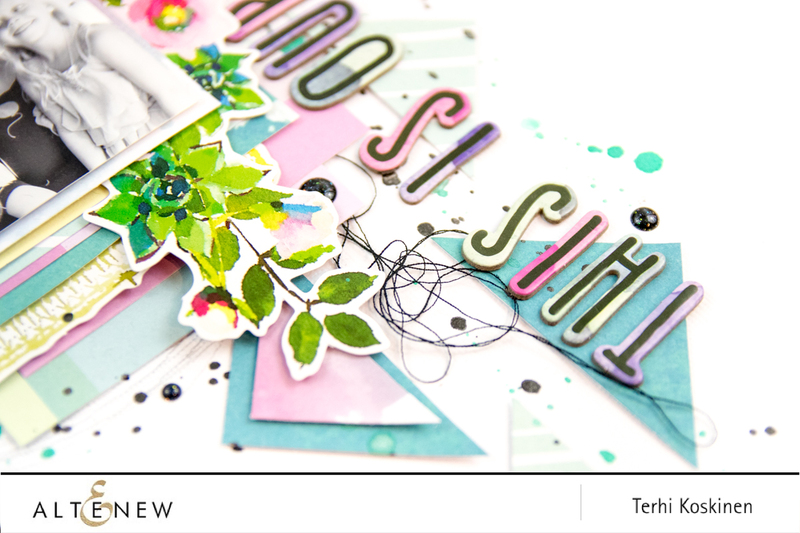 Love the beautiful colours you used on this lay out! Beautiful page!Like all this details and layers! Your family is adorable. And I like all the little details applied to your layout. 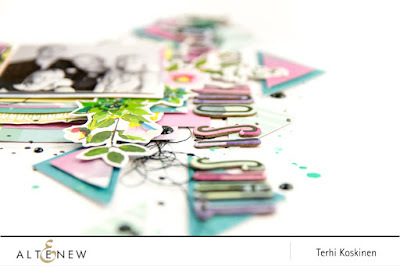 Great ideas, I haven't done much with scrapbooking but the ideas along this blog hop motivate me. The kit has such awesome contents, I am really into watercoloring so this is extra special. Beautiful page. Love how you've used so many of the wonderful new products. TFS your awesome talent and inspiration! Beautiful layout! I love the photo you used. Lovely project. Thank you for sharing. Gorgeous layout! I love the layering and the colours. Great page! Love those layers behind the photo! Beautiful layout! Love the placement of the triangles with your huge title - very striking! Love the layering and embellishments! Love what you did with this kit! Looking at your page I can see I have a lot to learn. The beauty in your example. The colors are so bright and cheery. I love the chipboard letters as well. Thank you for sharing. This is a sweet layout ! The colors used in your page layout create a stunning combination! The page composition is really interesting with how you treated the headline. Love it! Beautiful layout, love the colors and all the playful details. How beautiful! I love the layers of paper! Love the colours, layers and details. I'm going to enjoy this set. I love the style of your layout, it is so clean and modern but Altenew’s collection adds a softness with the great colours and fonts. Simple, clean, elegant LO. Such a beautiful family. The layout is really gorgeous! I love the lettering on the side. Your layout is stunning. I love the creativity you put into your layout. Love that little pop of green in your layers. Beautifully done. I just signed up for your newsletter because I love your design style so much and want to emulate it. Thank you for sharing your amazing talent. You bring out the beauty in this release. So pretty - love the layering and the soft colors. I love all the white space on your layout and the way your black and white photo really shows off the embellishments and papers! Beautiful, happy layout! Thanks for sharing! Such a beautiful layout. Your design is wonderful. What a lovely layout of your beautiful family! Love how you used the gorgeus products. Thank you for the inspiration! Ihana sivu! 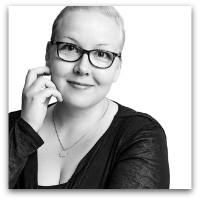 En tiennytkään että Altenew tekee skräppäyskokoelmia. The colors in this layout are terrific. And a pop of black here and there makes them stand out even more. Great dimension with the flowers and layers. What a lovely layout of a lovely family. 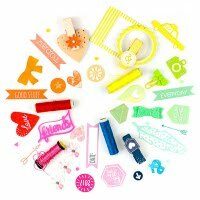 This release is so helpful for scrapbooking! Wonderful colors, thanks for sharing. Lovely layout. nice soft colors. Love the lettering going sideways!! Can't wait to continue on this hop. My wish list is groooowing!